Just below the surface of the vast Pacific Ocean, a powerful current streams rapidly along the equator from west to east. Thousands of miles after this oceanic superhighway begins its journey near Indonesia, it slams squarely into a tight-knit group of rocky spires that jut up from the seafloor and pierce the water’s surface off the coast of Ecuador. In a rush, the current finds a new path around the rocky islands. As the water changes speed and direction, it balances the spinning of the Earth and the rough touch of the wind. Much of the water diverges rapidly 50 or so miles to the north or the south of the islands, continuing its journey eastward. The remaining water is forced upward by the obstacles and flows up toward the sunny, warm, glittery surface. As the water upwells, it carries nutrients from the deeper ocean up with it. Those nutrients sustain tiny plankton at the base of the food web of a unique ecosystem. 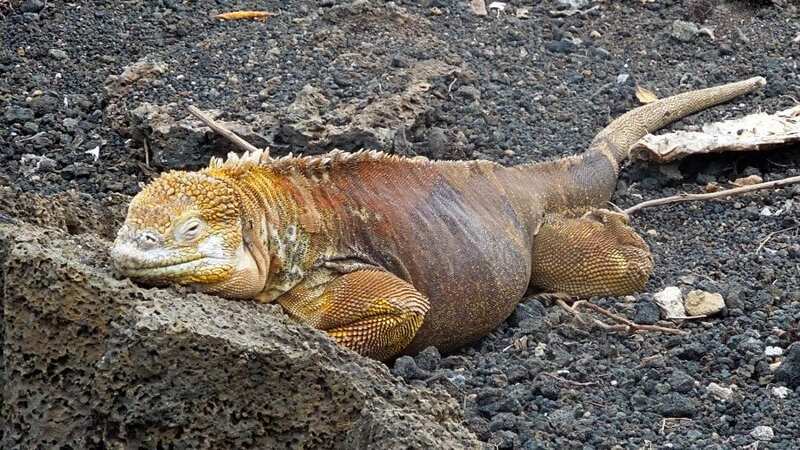 The jutting spires in the current’s way are known as the Galápagos Islands—home to giant tortoises, marine iguanas, finches famously studied by Darwin, and other species that are not found anywhere else on the planet. Scientists have long studied the animals that live on the Galápagos Islands. But they haven’t been able to examine the current that supplies the essential nutrients that nourish life as the water reaches the Galápagos. 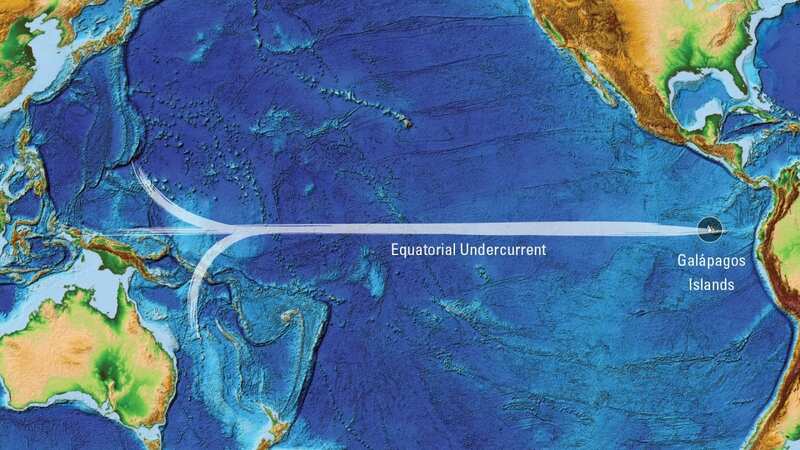 This immense river within the ocean is called the Pacific Equatorial Undercurrent, or EUC, and it’s one of the most vigorous and focused currents in the world’s ocean. It flows across the Pacific along the equator, extending about 100 miles wide and the length of a football field deep. In 2009, Kris Karnauskas, a former scientist at Woods Hole Oceanographic Institution, began knocking on the doors of his WHOI colleagues in search of ways to directly observe the path of the EUC near the Galápagos. Karnauskas uses computer models to simulate the ocean. 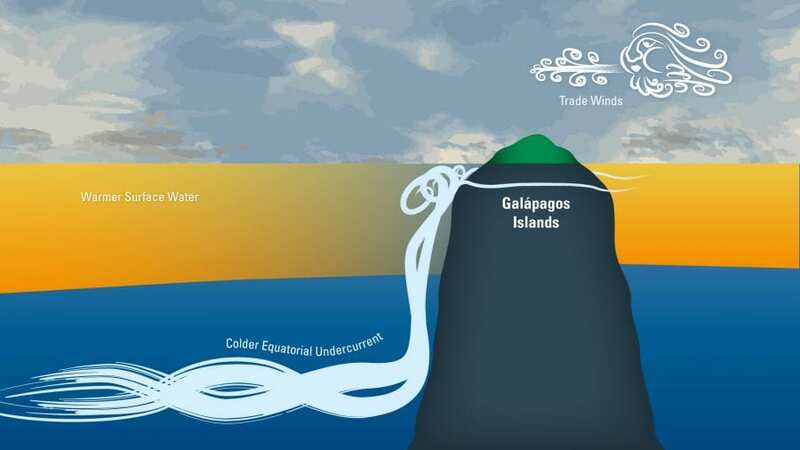 His models showed that the EUC upwells nutrient-rich water when it reached the Galápagos Islands and that the islands play an important role in determining the path of the EUC, but he needed evidence from the real ocean. It isn’t an easy task to chase down how the EUC forks, races, or meanders its way around the Galápagos Islands, or to capture how it changes over days, seasons, and years as it encounters the islands. How could it be accomplished? What tools could best reveal the details of what is going on beneath the surface and beyond the purview of satellites? Karnauskas found Breck Owens, a WHOI physical oceanographer with long experience making observations at sea. Owens had a solution—a set of tools he had used before in other regions of the ocean: Spray gliders. These untethered ocean-bound robots can dive below the ocean surface to measure seawater properties that scientists use to paint a picture of subsurface current systems. Karnauskas and Owens teamed up with Daniel Rudnick, a scientist at Scripps Institution of Oceanography who also had experience with gliders. Their plan was to use the distinctive capabilities of Spray gliders to understand what was happening to the EUC as it approached the Galápagos Islands. Gliders descend below the surface, sinking to 1,000 meters (3,280 feet) deep before ascending six hours later through the water, measuring salinity, temperature, and current velocities as they go. Returning to the surface, the gliders relay their data via satellite to scientists. The gliders are 6.5 feet long, with two wings extending from their cylindrical hulls. Without propellers or motors, they move by changing their buoyancy. Each glider has a pump that moves oil from a bladder outside its hull to one inside the hull, and vice versa. Moving oil into the internal bladder increases the glider’s density until it’s greater than that of the seawater around it, and the glider descends. Moving oil out of the hull and into the external bladder allows it to ascend. The wings keep the glider pointing at a slight angle up or down as it ascends or descends. To adjust their roll, a battery module shifts inside the hull to tilt the weight within the delicately balanced vehicle. At a speed of about a half-knot, the gliders dive, collect data on the way back up, and resurface about 3 miles down the line from where their dives started. Each glider carries carefully calibrated sensors that measure salinity and temperature of seawater at various depths. Onboard current meters measure the velocity of the water as the gliders move through it. If scientists need to change the gliders’ paths, they send new commands telling them exactly where to go. The wings of each glider are equipped with antennas that provide contact with scientists who can transmit commands to keep the gliders on their precalculated paths amid powerful forces in the sea that occasionally set them off course. The gliders dive again and repeat their measurements as they move up and down along their programmed lines, etching a sawtooth pattern in the ocean. Hence the project’s name: ROGER, an acronym that stands for Repeat Observations by Gliders in the Equatorial Region. From June 2013 to December 2016, a team of engineers and scientists deployed and redeployed a fleet of 12 gliders with the help of ships and crew from the Ecuadorian Instituto Oceanográfico de la Armada (INOCAR). The gliders set out along three routes: two pathways running diagonally to the northwest and southwest of the Galápagos Islands and a third running straight north and south along longitude 93°W between 2°N and 2°S—across the equator and the EUC. In July 2016, I was aboard INOCAR’s oceanographic research vessel, the L.A.E. Sirius, watching as skilled engineers such as Larry George from WHOI and Evan Goodwin from Scripps, familiar with every detail of each glider, checked and rechecked them before sending them off from the scorching deck, a few miles from the coast of an island in the Galápagos archipelago. Scientists back on land in the United States began sending commands to the gliders via satellite, intently watching their computers, waiting for return signals from the equatorial Pacific Ocean. Down go the gliders, using their precisely designed wings and carefully measured weight to dip through the chaotic ocean surface layer where air and sea meet. As they descend, they no longer feel the gusting wind at the surface pushing them westward. The gliders are carried gently eastward by the subsurface current as they leave the ocean surface behind. They continue to dive deeper, where only the faintest rays of golden sunlight remain and the water temperature drops rapidly. The eastward push starts to strengthen, harder and harder. This intensity, this constant force within the ocean, is the current known as the EUC. As the gliders continue downward past the EUC core, the current finally shows signs of weakening. The colder, denser ocean here is calmer, with pockets of quieter currents making their way slowly east or west. A glider on a similar journey, taking place a few miles farther north, finds itself resisting a soft northward flow to maintain its path. Eventually, the gliders reach their depth limit at about 1,000 meters (3,280 feet) and, against the weight of the water above them, start their reverse journey back through the EUC above until they reach the sunlit, airy surface. The ocean is an ever-changing place, full of motion and disturbances. Ocean gliders are not immune to these variable current patterns. Scientists periodically check each glider’s GPS position as it surfaces, ready to make adjustments as the unpredictability of the ocean presents itself. 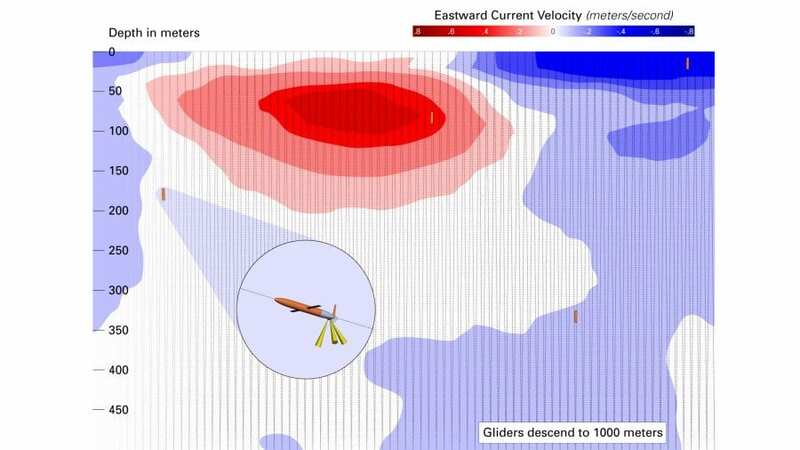 At the same time, the gliders calculate their own velocity over the previous drive by examining how long it took to get from the starting point to the ending point of the dive. Using that information, they make automatic adjustments to the next dive to stay on track. As the gliders dive and ascend, over and over during the course of three years, not all goes according to plan. It’s not uncommon for gliders to have unexpected adventures along their way. After some time in the sea, a glider occasionally fails to follow scientists’ orders, straying wildly off course. Scientists tell it to let the strong current carry it back toward the Galápagos, where a boat picks it up so that engineers back on land can diagnose the glider’s problem, fix it, and return it to service. These gliders find themselves host to mobs of barnacles that multiply and grow quickly, thanks to the high-nutrient water transported by the current that the gliders are attempting to measure. In another case, a glider fails to ascend as planned because a curious shark may have discovered that gliders do not taste as good as they first appeared. 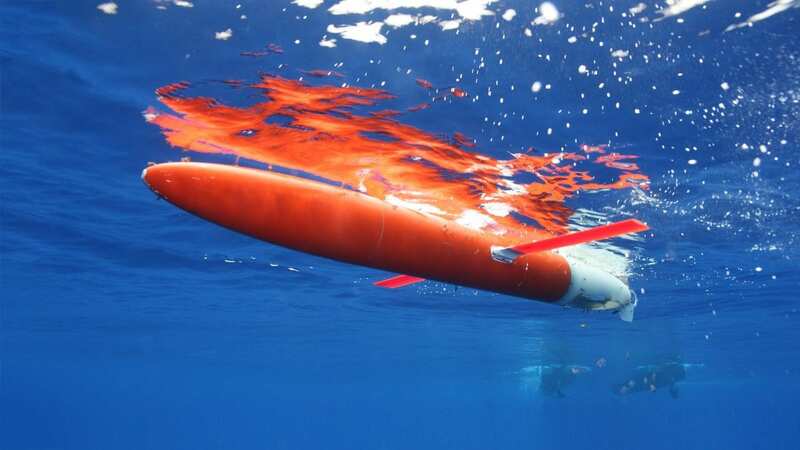 Engineers remove the barnacles and replace shark-bitten gliders, and the glider fleet continues its measuring missions in the erratic ocean. The Equatorial Undercurrent is the result of a mammoth seesaw operating in the Pacific. Under normal conditions, powerful trade winds blow east to west across the equatorial Pacific, creating a westward surface current. Warm water, heated by the equatorial sun and blown by the wind, piles up in the western Pacific. The piled-up surface waters in the west want to flatten out to keep the ocean surface at an even level. They exert downward pressure on deeper, colder waters below. They force those deeper waters to flow eastward, underneath the wind-driven surface current, to replace the surface waters flowing westward. The deeper, eastward current is the EUC. But periodically during El Niño events, the trade winds die down, piling up less water in the western Pacific. With less difference between sea surface heights in the west and the east, less water needs to flow eastward below the surface to even out the sea surface level. The EUC becomes weaker. In the winter of 2015-16, the gliders began to measure a change in the equatorial Pacific Ocean. Slowly, it began to heat up, abnormally so, until it became clear that an El Niño period had arrived. The El Niño continued to strengthen beyond what anyone could have predicted, giving the ROGER team an unexpected but exciting chance to collect glider measurements on the strongest El Niño event ever recorded. Scientists can use those measurements to understand with unprecedented resolution what happens to the equatorial current system just west of the Galápagos Islands during an El Niño. Those same observations will be used to see—in a way we have never been able to do before—where the EUC goes below the surface once it reaches the Galápagos Islands. Does the EUC’s journey continue past the islands with a focused core, moving north or south of the Galápagos? Does the EUC help feed the cool tongue of water extending westward from the coast of South America? Does it end at the Galápagos Islands, upwelling most of its waters? Or does it do a combination of these things, or find another path we did not expect? Finally, after three years of passionate, persistent, calculated work, the data are in our hands. It is now our task to make all those years of dedication by the ROGER team worth it, to look carefully into the data, uncover the dynamic, mysterious EUC as it reaches the Galápagos Islands, and tell a story about the movement of the ocean that surrounds and feeds one of the most unique ecosystems on Earth. What will we reveal? This research was funded by the National Science Foundation, the NASA Earth and Space Science Fellowship, the J. Seward Johnson Fund, and a Karen L. Von Damm Fellowship.